The Vista 50 SF is built on a beamy 16 foot wide hull, with a large salon and galley up. The Vista weighs in at a relatively light 36,000 pounds. Note the raked flybridge and distinctive foredeck “arms” extending from both sides of the deckhouse. The accommodations are spacious and open – THREE stateroom layout with galley located in the salon. Teak panel and trim are used throughout the interior. A sliding door opens into the huge and unobstructed fishing cockpit which is down two steps from the salon level. 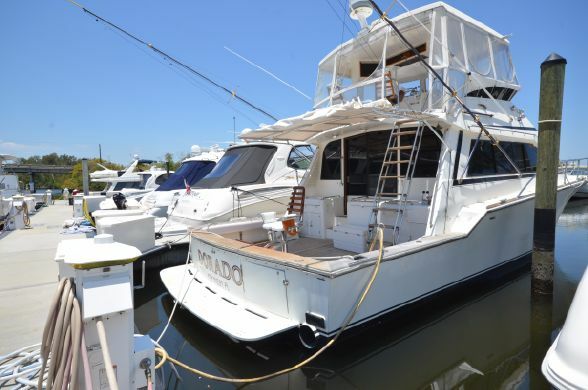 A molded tackle center is standard along with cockpit controls, transom door, fish box, etc. and there’s cockpit access to the enormous engine room. Additional features include a bow pulpit, reasonably wide sidedecks and a spacious flybridge with good visibility fore and aft. The Vista 50 SF is equipped with Detroit Diesel 8V92 – 735HP, generator, air conditioning, outriggers and isinglass bridge enclosure.